Physiotherapy is a frontline health practitioner service meaning you do not require a referral. In some cases, for example, if you have a work injury or get injured in a motor vehicle accident, then a doctor's referral is necessary. Furthermore, if you have an ache or pain that has lasted more than three months, you may be eligible for a care plan, which would enable you to have five bulk billed visits. For care plan eligibility, please see your General Practitioner. If you have any other queries regarding Physiotherapy, then please see our blog how do you find a Physiotherapist. With our Warwick office being located inside the Warwick Stadium sporting complex, the majority of clients we treat are from the sporting population; However, our team is experienced and capable to treat all issues/injuries you may have. We treat clients of all ages from infants to grandparents. 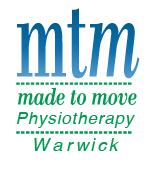 The team at MTM Physiotherapy Warwick has an excellent relationship with the staff and members of Warwick Workout. Due to this relationship, we are fortunate enough to have access to the state of the art facilities that they provide. If your injury requires gym based rehabilitation or assessment, then we will ensure that those needs are met.